Faraway Pillow: Crash and Burn! 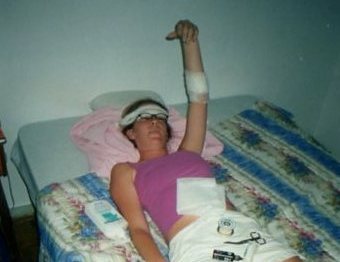 Mishaps occur in life and travel is no exception. Whether you unintentionally break the law, have a traffic accident or simply run out of petrol, be prepared for the unexpected and make the best of the circumstances while abroad. We’re trying to make the best of the situation as we lie stunned in a pool of blood and gravel. ‘I will take you to hospital, you must go to hospital!’ cries a worried Portuguese man as he runs out of his car toward my fiancé and me. Several other cars stop behind him and also offer to help us seek medical care. 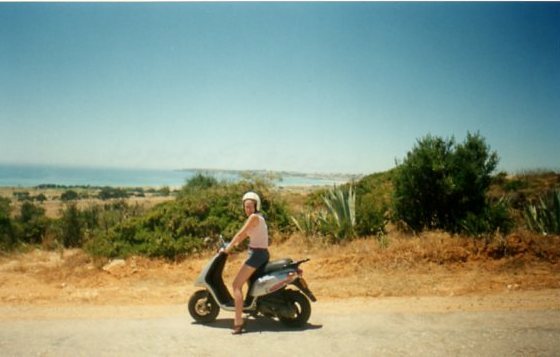 We’ve just had a grisly scooter accident and have crashed and skidded along a dirt road in the Algarve region of Portugal. We’re in the small, coastal town of Lagos and the people here are unusually friendly. People show genuine concern for our misfortune and offer what help they can. We’re not badly hurt but have sustained some serious skin abrasions. My flesh has been grated by the small pebbles on the road and is oozing dirt-spotted blood. My right inner arm and portions of both legs have been scraped raw. I hiss with pain as the cool, salty, sea air enters my open wounds. We politely refuse to go to the hospital when several bystanders offer to take us. We’re currently uninsured back home and are backpacking through Europe for the summer. We don’t want to spend what remaining money we have on a trip to the hospital. ‘Oh, we’ll be fine’ we persuade as we thank them and hop back onto the rickety scooter. 'Stupid Americans', is the thought most likely going through their heads. We return to our apartment and raid the first aid kit. Inside we find a bottle of iodine. I remember from a medical drama I used to watch back in the States that doctors often prep a surgery sight by swabbing the skin with iodine, a strong disinfectant. I suggest we pour the pungent brown liquid over our lesions. We stand in the bath tub and pour a generous amount over each of our gashes. My fiancé screams with torment and tears drip down my face. ‘Can this be right?! ?’ my fiancé yells. ‘I don’t know…I saw them do it on ER once!’ I cry. ‘Oh, great, medical care learned from a television show!’ he mocks. ‘Well, it’s the best we’ve got!’ It will sterilize the wounds and prevent infection!’ I argue. We finish our treatment and prescribe ourselves a beer to dull the pain. After the sting of the iodine subsides, we begin to laugh about our calamitous scooter ride. With drinks in hand and our wounds covered with enough gauze to pass as mummies we recount the ill-fated excursion to Chris, our roommate. Unfortunately the crash was just the big finish to our scooter experience gone amiss. Within the span of two hours we ran out of gas, were pulled over by the police for not wearing helmets, subsequently evaded penal action and finally crashed the scooter while rounding a curve along a small rock-strewn road. Shortly after we rented the scooter, before we even had a chance to really stretch her legs, we realized the old girl’s gas tank was empty. Luckily the scooter put-putted to a halting stop within walking distance of the petrol station. We pushed the scooter to the station, filled her up and kept on scooting. About an hour later we passed the police station and were waved over by two irritated police officers who spoke absolutely no English. They signalled by pointing to their heads and aggressively scolded us by wagging their fingers back and forth. We assumed there must be a helmet law we hadn’t abided by. They gestured with their hands to wait and went into the station. Instead of awaiting our punishment we peeled out with haste. We scooted as fast as our little scooter would scoot and evaded the officers like outlaws, riding our trusty steed into the sunset. Little did we know that onward, toward that apricot-colored sunset, our trusty steed would bite the dust. We crashed our little scooter on the way back to our apartment; a grand finale to our scooter debacle. At that point we realized maybe the scooter rental just wasn’t meant to be. The universe has funny ways of indicating star-crossed incidences. However, things always happen for a reason. After returning the scooter we were able to discover hard-to-reach areas of the town by foot. We were able to experience views from the rocky cliffs of the Algarve coast that would have been completely inaccessible on the scooter. Not to mention we had a real comedy act going anytime we told this story to friends, family and fellow backpackers. The moral of the story is that before engaging in traffic abroad, learn the laws, check your gas tank and drive carefully! Blunders are bound to happen while travelling and are oftentimes hilarious to just about everyone but you. Take a cue from the universe and try to laugh while trying not to cry.